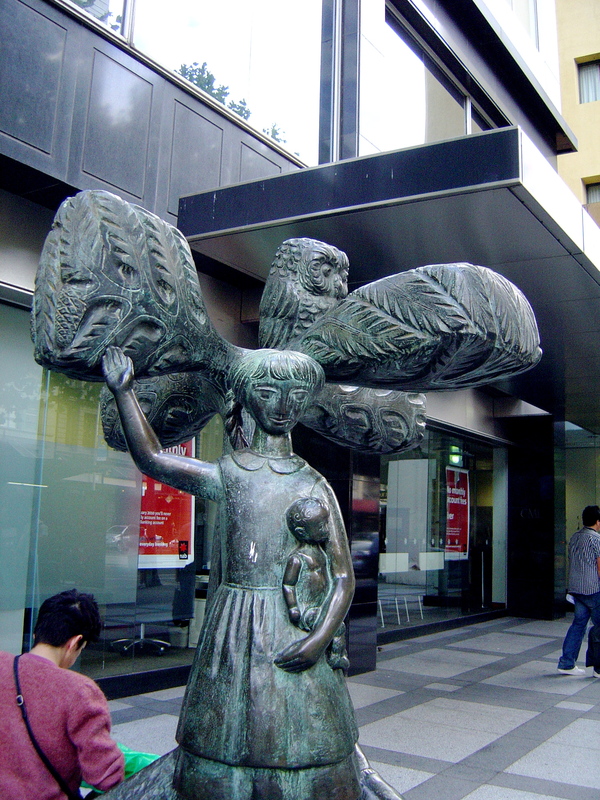 Southgate on Southbank was one of the first shopping centres in Melbourne to commission notable sculptors to create a collection of public art for the centre. Positioned right next to the Arts Centre, it is on the border of Melbourne’s arts precinct but it is still a shopping mall; there is a food court at the river level. This means that however good the restaurants and however classy the specialty shops, including those that call themselves art galleries, there is a certain kind of homogenised taste that goes with a shopping mall. I have looked at shopping centre art before; Barkely Square Shopping Centre in Brunswick and Melbourne Central in the city. There is more I have yet to see Robert Hague West Orbis (2009) four metre tall sculpture at Chadstone Shopping Centre or the Lenton Parr sculpture at another. At Southgate the main problems has been with the placement of the art. Sitting alone upon her own dusty inaccessible balcony is Loretta Quinn’s ‘Crossing the First Threshold.’ This is a bad case of dumping a sculpture in a poor location. Hardly anyone notices this sculpture and it has been reduced to being a bird roost. Not surprisingly, Loretta Quinn is better known for her sculpture at the city square. Maurie Hughes’s spiky style is evident in Southgate Sheraton Complex Gates, Forbidden Areas, 1992. I have never seen the gates closed so I don’t know how forbidden the area behind them is but the gates are pretty spiky with the demons and spears. 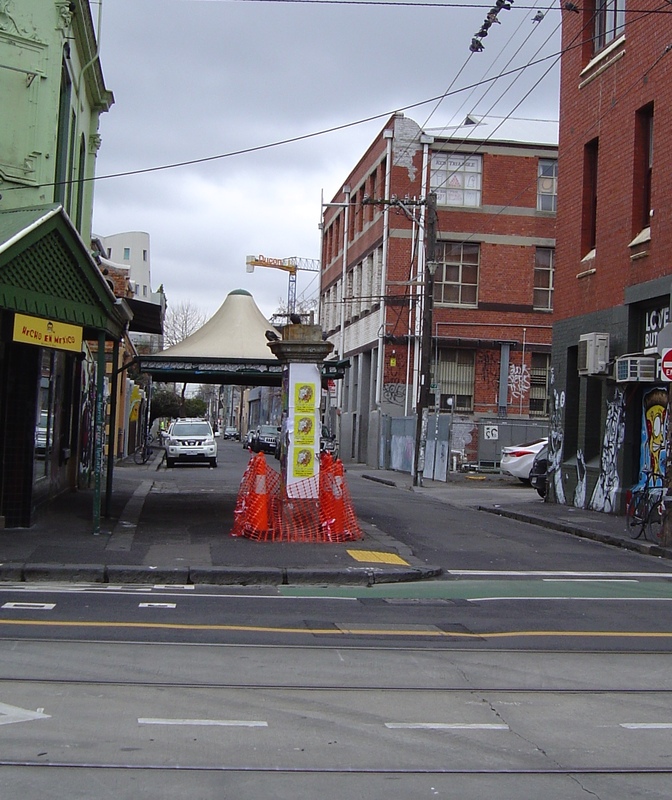 Hughes is best known for his sculpture Ceremony and Vehicle for Conveying Spirit on Russell Street but he also has a few other public art commissions including the Security Gates, 1994, Lincoln Square South in Carlton. Hughes has his home and studio in South Melbourne and taught at art department at Frankston’s TAFE. Ophelia by Deborah Halpern is part of the Southgate complex although it is now located closer to the river than it once was, see my post about its move. It is made of ceramic tiles over a fiberglass core and was cleaned and restored in 2011 when it was moved to its current location but it looks like it could do with another restoration. There used to be a sculpture on the upper level mall, the seated figure of a woman, Maggie by Peter Corlett was made of ciment findu, a type of calcium aluminate cement. It was vandalised beyond repair. Public art is not safe even with the security in shopping centres. This brings together two issues, the placement of the art to allow public interaction and to prevent damage to the work from this contact. Alex Goad’s biomorphic Tethya on the corner of Fitzroy and Jackson streets in St. Kilda is a recent public sculpture. Since my history of Melbourne’s public sculpture was published last year there are a few new public sculptures around the city. Not that Sculptures of Melbourne was intended as an index of all the sculptures in greater Melbourne, that would be insane as I included street art sculptures. Two ballet dancers, Les Belle Hélène by David Maughan, were installed on the lawn at the Arts Centre. And John Olsen’s Frog was installed in a pond in Queen Victoria Gardens. As if either location needed any more sculptures. 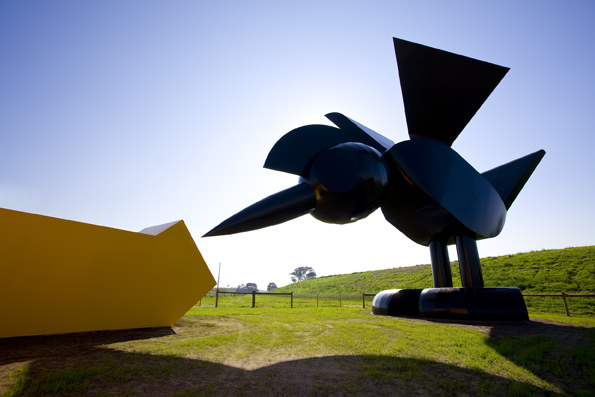 Further out of town and in a better, some might even say “site specific” location, John Kelly’s Man Lifting Cow was installed in Sunshine marking a return to his home suburb for Kelly. Brimbank Council really milked the cow with associated events: the 1000 cow project, an art prize, a John Kelly exhibition and an education program at the Brimbank Civic Centre. Most of the recent public sculpture has been temporary sculptures or pieces put up by street artists. Local street artist, Kranky and other were reviving Presgrave Place. Ironically there were several street sculpture homes this year including several by MOW from the USA. MOW was in Melbourne sticking up a few tiny doors and windows. The campaign this year to save Chris Booth’s Strata had a happy ending with MONA agreeing to take the sculpture and pay for it to be reassembled. Melbourne’s loss will be Hobart’s gain. There was no campaign to save Peter Corlett’s sculptures of John Farnham, Dame Nellie Melba, Dame Edna Everage and Graham Kennedy in the Docklands. There were many reasons for this chiefly because they had very little artistic quality, few people in Melbourne want to remember that these entertainers came from Melbourne and no-one ever saw them in the Docklands. 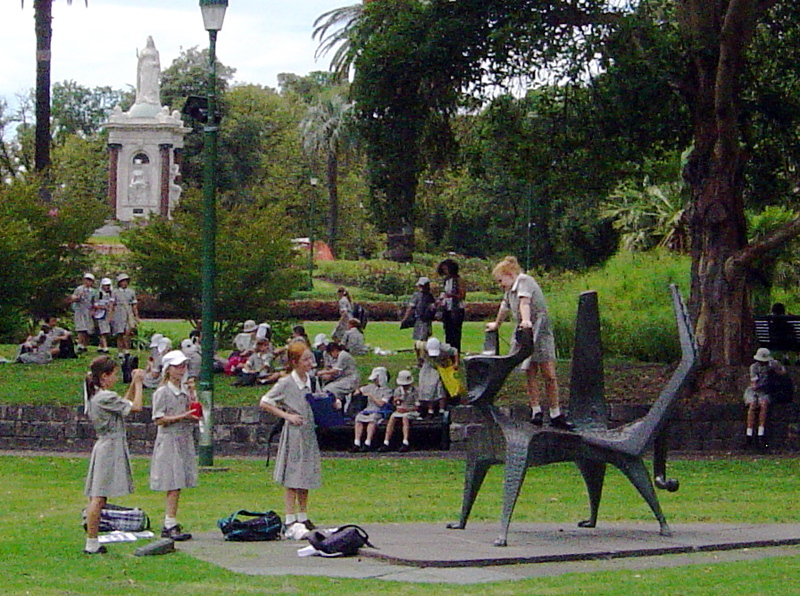 These Melbourne public sculptures are all intended for children, due to their theme or because they can be played on. Although Inge King did not intend the black curves of Forward Surge at the Arts Centre for any particular audience, she does appreciate the enjoyment that children get trying to climb up the curves and sliding down. Definitely for any child with ambitions to climb sculptures. This is without looking at the sculptural value of play equipment like the dragon slide in Fitzroy Gardens or a carved logs in the playground of the Fitzroy housing commission flats. 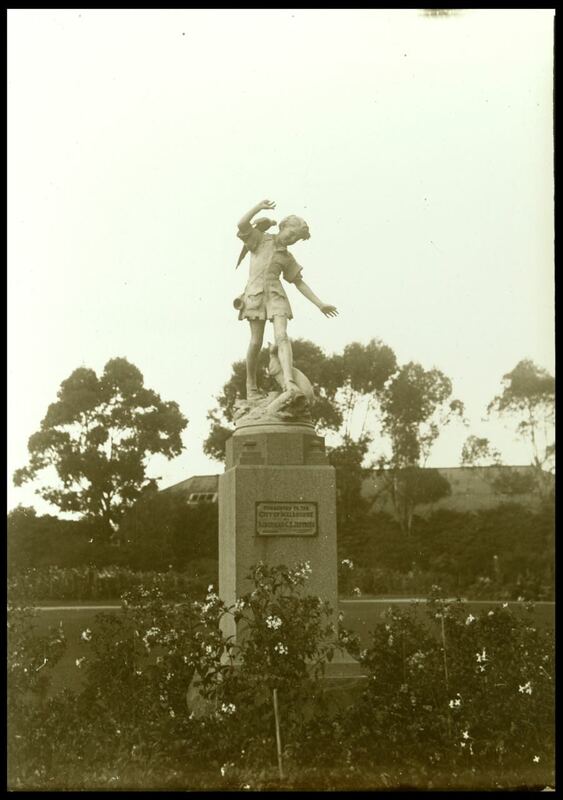 Paul Montford, Peter Pan, 1925 Melbourne Zoo The figure of J.M. 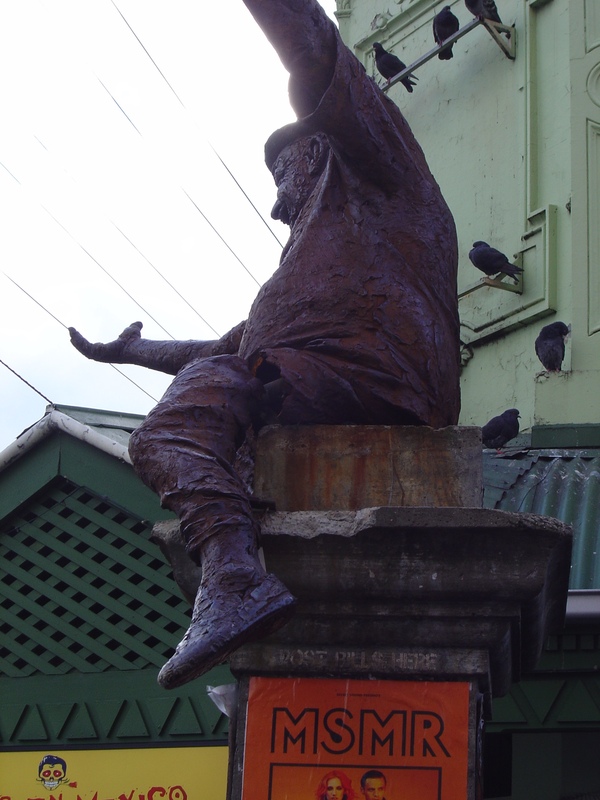 Barrie’s Peter Pan is modelled on Montford’s son and the flora and fauna on the base are all Australian. 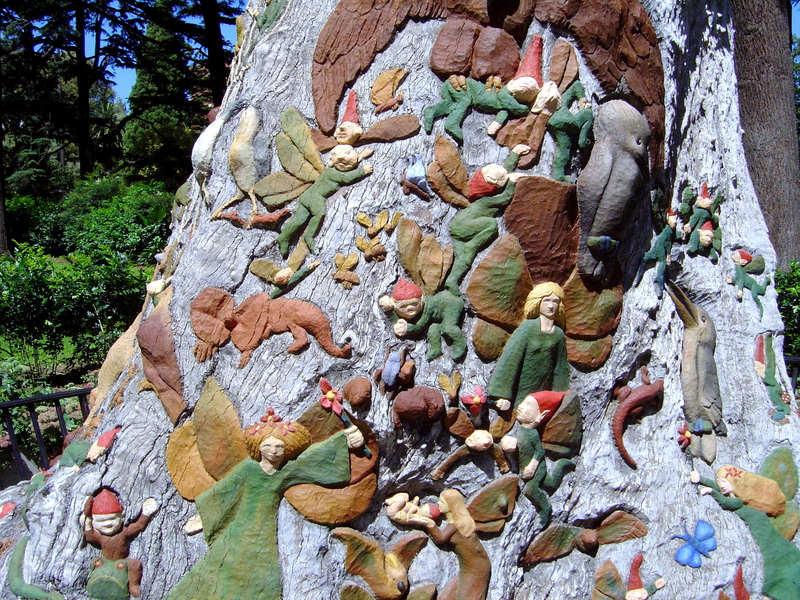 Ola Cohn, Fairy Tree, 1934, Fitzroy Gardens, Like Montford’s Peter Pan, the fauna on Cohn’s Fairy Tree are Australian. Cohn also wrote a Fairy story to go along with her carving. Tom Bass, Children’s Tree, 1963, Elizabeth Street, Bass intended for children to climb on this sculpture. 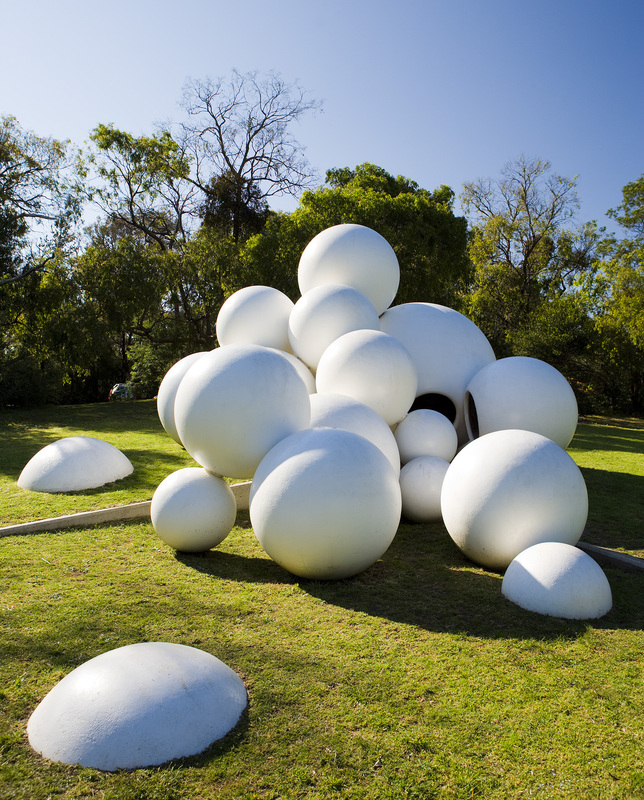 Peter Corlett, Tarax Bubble Sculpture, 1966-68 Originally at the National Gallery of Victoria it is now at the McClelland Sculpture Park. 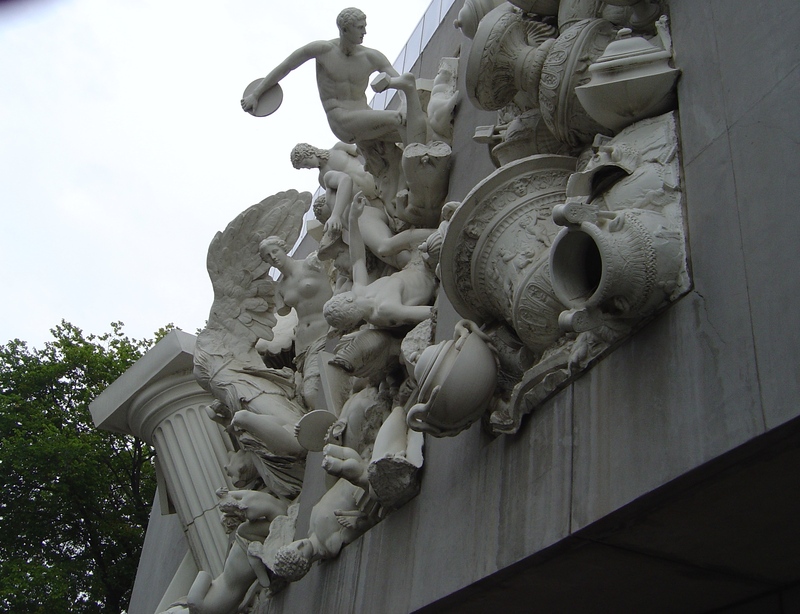 The sculpture was intended to be climbed in and on. 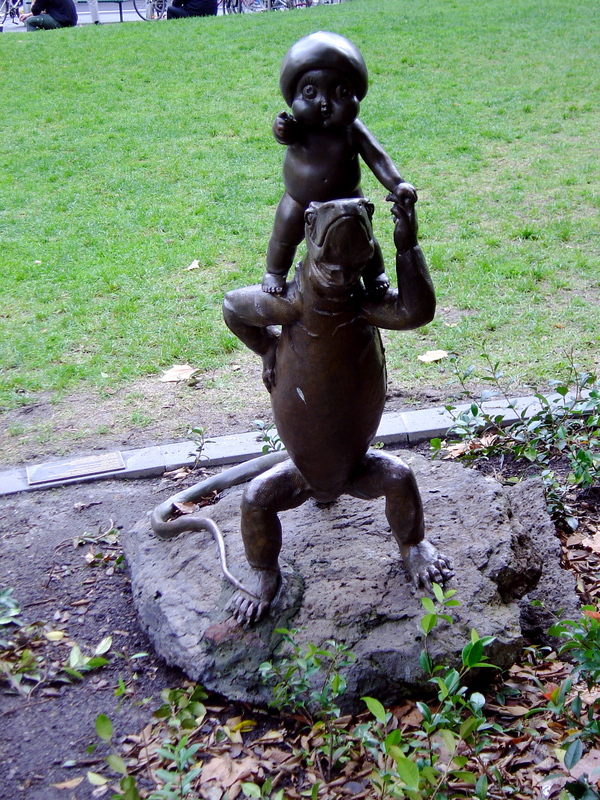 Tom Bass, Genie, 1973 Queen Victoria Gardens, Melbourne, Bass intended to be climbed on by children. 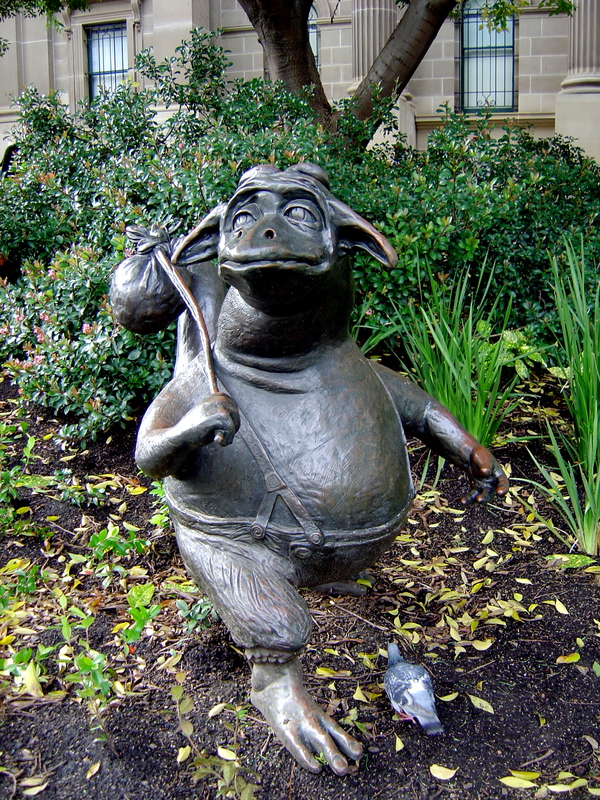 There are two sculptures based on children’s book illustrations State Library forecourt. Ron Brooks, The Bunyip, 1994, from Jenny Wagner The Bunyip of Berekeley’s Creek. 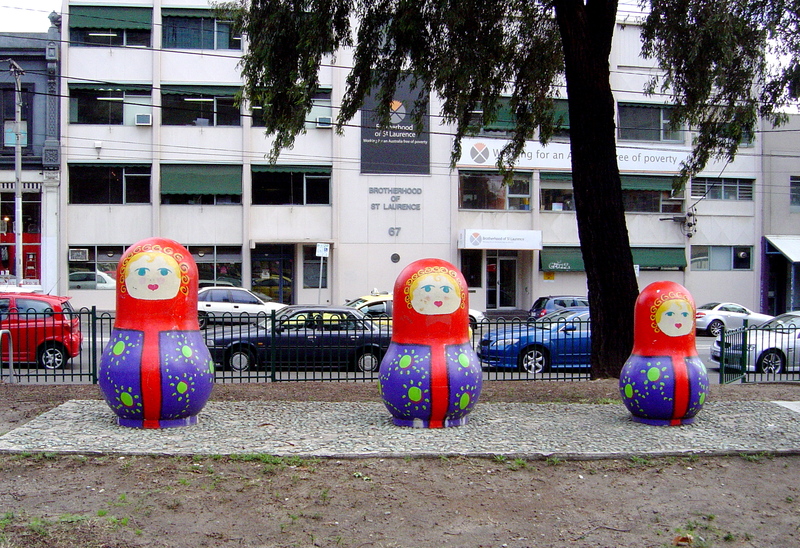 Browen Grey, Matryoshka Dolls, 2002, on the corner of Brunswick and Gertrude Streets. Emily Floyd, Public Art Piece, 2006 EastlLink. Even though children can’t climb on it or even touch it Floyd did make it with the children in the back seat of the car in mind. I will end this with a plug for my book Sculptures of Melbourne, a history of Melbourne’s public sculptures. 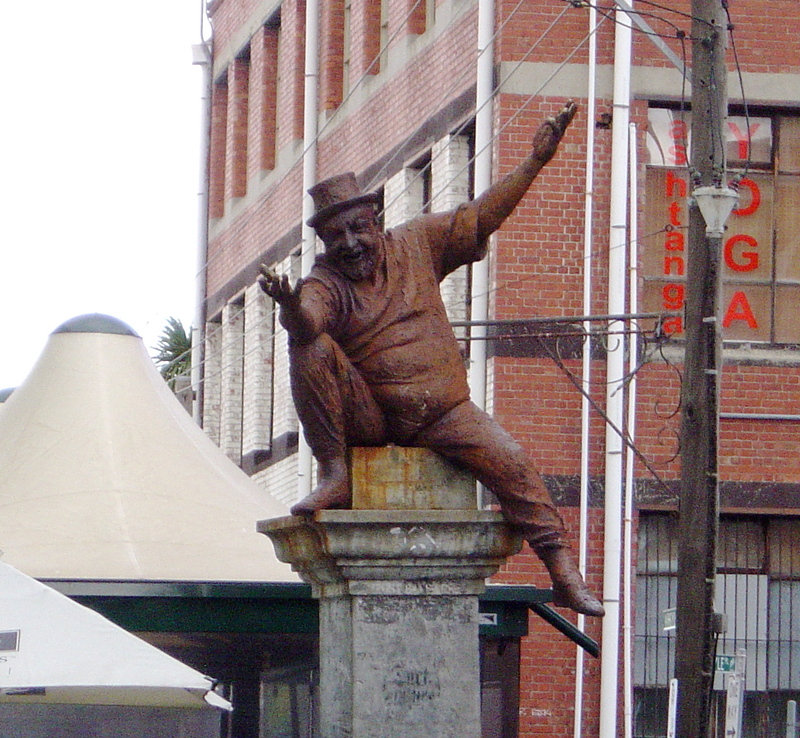 Last month Mr Poetry, the sculpture of the fat man on the corner of Brunswick Street and Argle Street in Fitzroy, was hit by a truck. One leg and part of the plinth were broken in the accident. The outer bronze shell was cracked at the thigh and the steel armature exposed. The sculpture is now at the Perrin Sculpture Foundry in Cheltenham and Bill Perrin, who originally cast it, is repairing it. Bronze sculptures are repairable, the sculpture was originally welded together from separate parts, the broken leg will be welded back into place and then application of the rust-red patination will conceal the weld. I spoke to Peter Corlett about the accident. He is philosophical about the damage and told me that this is the second time that the sculpture has been hit by a truck. “These things happen in a vibrant city.” Corlett thinks that the truck was probably doing a three point turn and that the driver was probably watching the plinth in his review mirror but didn’t see the leg sticking out. Although the figure will be repaired and reinstalled the minor damage to the side of Mr Poetry’s plinth will not be repaired. As the plinth is concrete there would be difficulty in getting the repair to match and Corlett thinks that the slight damage will fit in with the atmosphere of Brunswick Street. 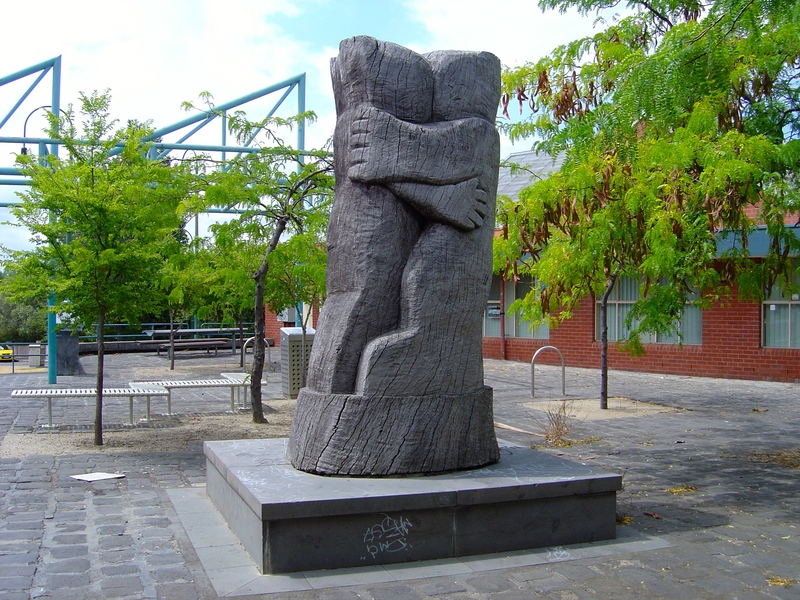 The Yarra City Council has plans to install a bollard on the corner to provide protection for the sculpture in future. Read my earlier post for more on Mr Poetry. On my way to Sutton Gallery on Brunswick Street in Fitzroy, one of the problems of rigid sculptures was made brutally obvious to me. 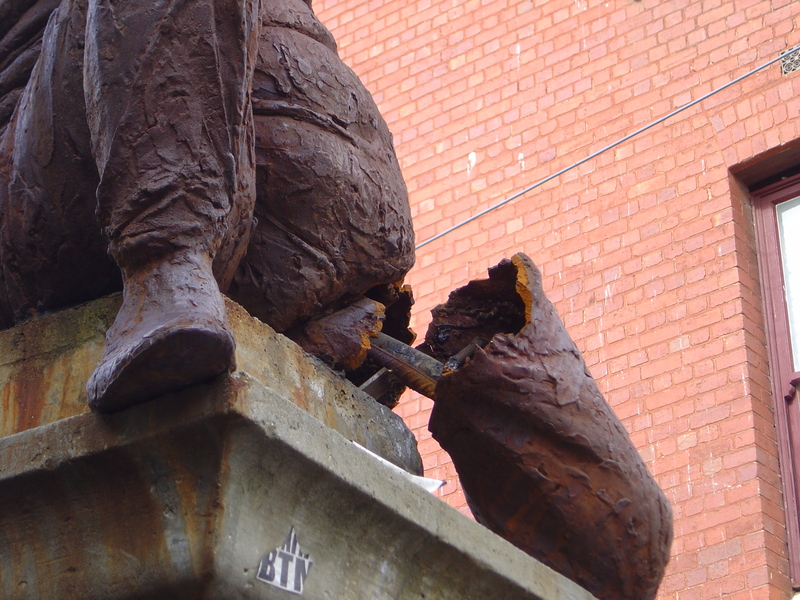 One of the legs on Peter Corlett’s Mr Poetry was broken, the rigid bronze shell was fractured and the leg was only attached by the greater strength and flexibility of steel armature. The plinth had also been damaged where it was hit by the leg. Serious damage, but probably not irreparable. 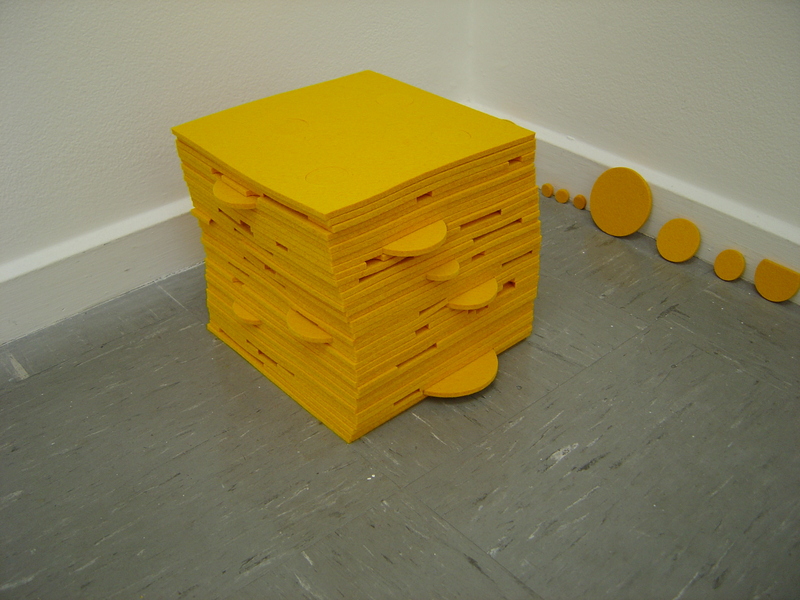 An alternative to the standard rigidity of sculptures in both materials and concept is demonstrated in two current post-minimalist exhibitions: established international artist, Peter Robinson’s Neologisms at Sutton Gallery and emerging artist, James Parkinson’s exhibition Free Time at Seventh Gallery. 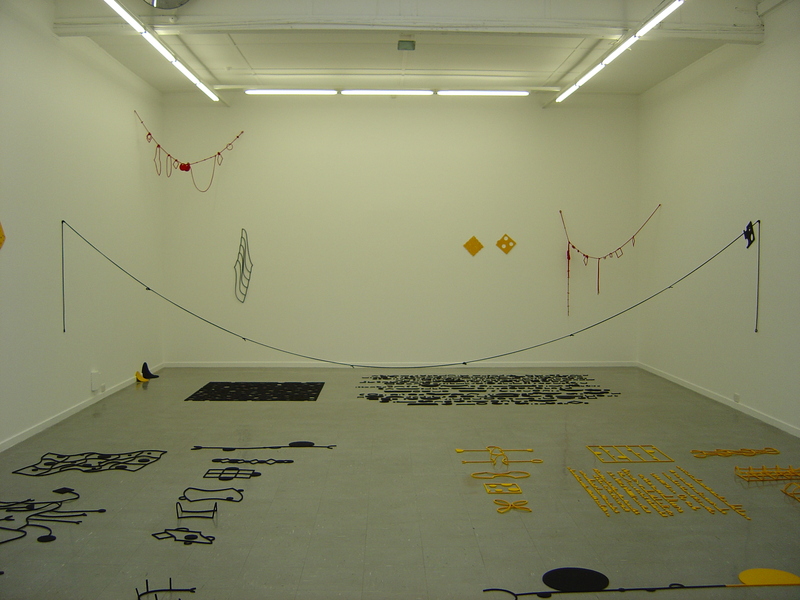 New Zealand artist, Peter Robinson has cut pieces of black and yellow felt sculptures that are pinned to the wall, stacked in piles, place against the wall and laid out on the floor. Some parts suggested letterforms, the new words of the title like the embossed text of a plaque. 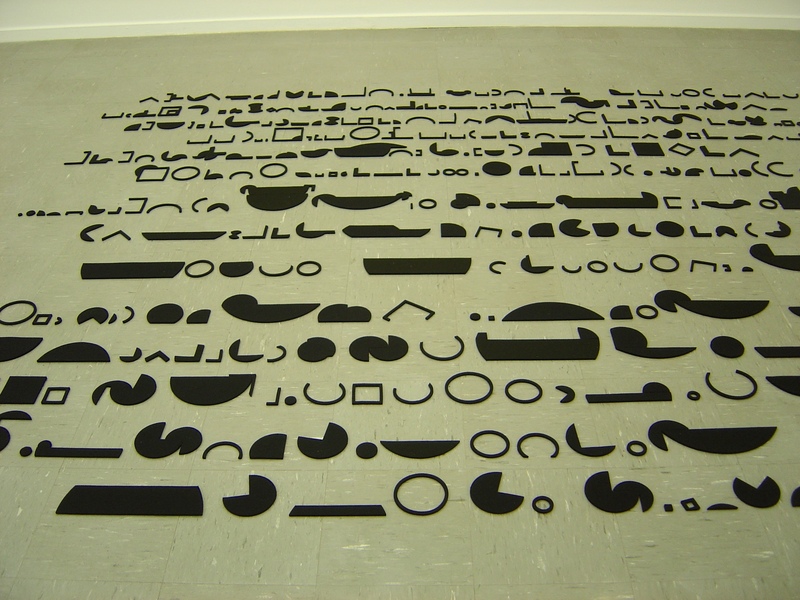 Robinson uses both the positive and negative forms and there doesn’t appear to be any waste material – it is all present. Neologisms appeared to be commenting on the history of modern sculpture. From Marcel Duchamp’s 1918 Sculpture for Traveling made of rubber and string with ad lib dimensions. The grid of modernism hangs on the wall distorting its rigid geometry, the cube of the minimalists is made of felt sheets stacked in a corner. There is even a playful piece of figuration while other forms looked like early Geoffrey Bartlett sculptures. Although flexible sculptures do not so much define a space, as they are defined by the space and the pull of gravity, Robinson’s Neologisms determined the viewer’s movement around the gallery. Clear paths are laid out between the blocks of forms, there are linked chains across part of the gallery blocking movement and a reference to Robinson’s earlier sculptures involving styrofoam chains. A few blocks away from Sutton Gallery at the shopfront artist-run-space of Seventh Gallery was another post-minimalist exhibition by an RMIT fine arts student, James Parkinson, Free Time. People kept on coming in from the street and asking: “What is this place?” Only to be told by the attendant that it was an art gallery and yes, you could play in the ball pit. The main gallery at Seventh is filled with plastic balls of different colours, you have to wade through the balls to see the other rooms at Seventh. 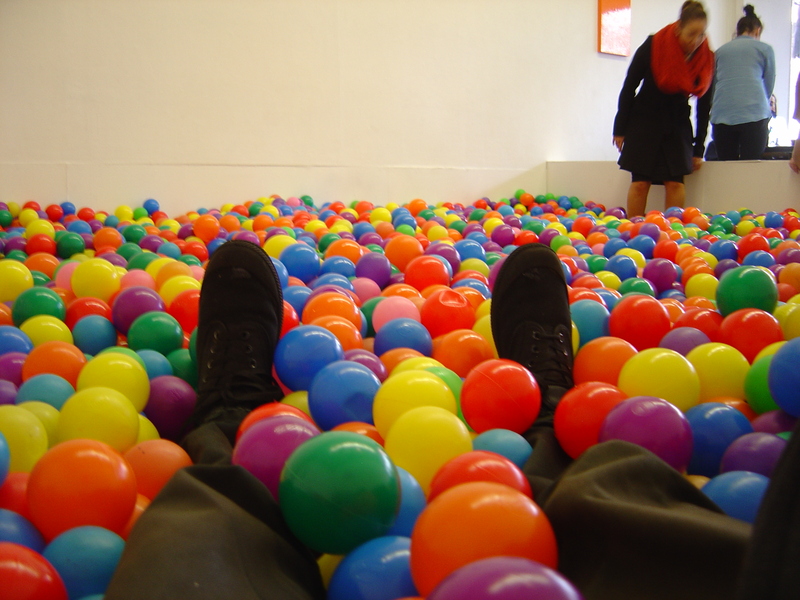 Parkinson calls his ball pit, ‘Prison’; the balls are in a prison, contained within the low walls at the front and back of the space. This prison gives freedom to enjoy the ball pit and playing in the ball pit is fun. Free Time consists of a ball pit, a post-minimalist sculptures made of many plastic balls and four walls pieces, walls of plastic Lego blocks in uniform colours: grey, sky blue, orange and pink. (Where do you get Lego in those colours?) There is a fun contrast between lack of play in the rigid walls of Lego blocks and play of the ball pit contained with its rigid walls. Post-minimalist adds a degree of play, levity and oxymorons to the serious formal rigidity of minimalism. This flexibility gives the sculptures freedom, their flexible form has play in it, in that the materials have give and there is some slack. 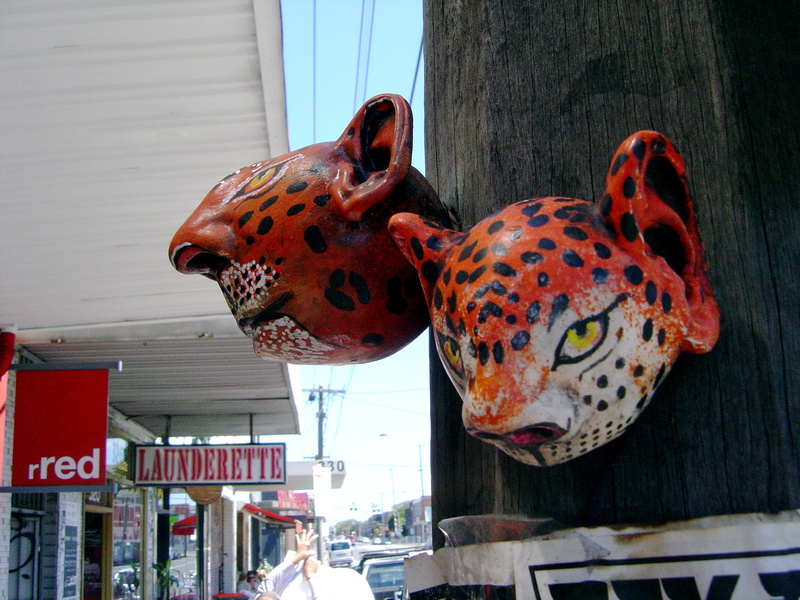 I’m currently polishing the manuscript for my book Melbourne’s Sculpture – from the colonial to the ephemeral. It is due to be published by Melbourne Books later this year. Making sure that all my photos are labelled correctly, organising the bibliography and list of index terms is dull work. There has been some dull reading too; just be glad that I read some of those dull books so that you don’t have to. It has not all been dull; I have been enjoying meeting sculptors and exploring the city to see new sculptures. Just working at my computer when I received a phone call from Bruce Armstrong in reply to an email that I’d sent about a month before through John Buckley Gallery who repents him. The email from Maurie Hughes came at just the right time as I was struggling to make sense of sculpture in the 1990s. Some of the highlights have been enjoying great steaks and wine over a lunch with Lou Laumen at the Station Hotel in Footscray. Visiting Peter Corlett in his studio at the back of his beautiful garden and visiting Meridian Foundries with him. He gave me a little tour of the foundry and introducing me to Peter Morley and the workers. I have not been stuck in front of the computer the whole time. I have been visiting new parts of the city in my search for significant public sculptures to photograph. I hadn’t been out to Footscray or Preston in years. I had never been out to see EastLink offices in Ringwood; the offices are a beautifully designed. EastLink was very helpful, allowing me to use their photographs of the sculptures for free and providing me with a folder of articles on them including one by Ken Scarlett that I was looking for. Sometimes I have felt like a detective tracking down information from a scattering of clues. I had to make contact with some artists for copyright permission, sometimes anonymous street artists based on little more than a photograph or the initials GT. (I am still trying to get in touch with Mal Function.) Trying to locate George Allen’s Untitled, 1957 a couple of tons of rock that just disappeared. Discovering the lies that Charles Summers told to Governor Darling about the casting of the Burke and Wills Monument. It has been fun having my ideas challenged and changed. Sculptors who are conservative artistically but a progressive politically. Large corporations are more progressive artistically than local governments. City governments are capable of planning and enacting long term. Enough to make my mind spin a couple of times. I’ve had a lot of help from artists, academics and various test readers who volunteered to read my manuscript. I still have to polish the manuscript some more and check the acknowledgements section to make sure that I’ve got all the names right. I will be glad when I can hand the manuscript and photographs over to the publisher next Monday. Not that I will be finished with the book but it will mark another point in the process. (See my December post: Book Deal.) I still have to find an image for the front cover.